NEMO Vector Sleeping Pad. Vector™ features NEMO’s lightest weight fabrics, integrated footpump and cutting edge insulation. Constructed with low-stretch fabric baffles to eliminate elasticity, Vector’s height, stability, quiet fabrics, paltry weight, and packed size make it the ultimate in ultralight pad design. The integrated foot pump is fast and efficient, and vastly superior to using your lungs. A metalized film layer provides insulation while maintaining an ethereal weight. The height, stability, quiet fabrics, and paltry weight and packed size make this series the ultimate in ultralight pad design. 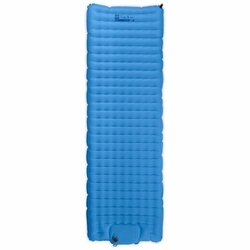 Undulating Lateral Baffles offer the most comfortable and unobtrusive topography for sleeping pads. Thermal mirror featherweight aluminized film reflects radiant heat.